Model 7120R is a double-flash strobe designed for heavy duty industrial use in steel mills and large manufacturing plants where very high light output is required. At 40 flashes per minute and 2000 effective candlepower it is Tomarï¿½s brightest industrial visual signaling device. It features a remote mounted solid state power supply in a NEMA 4 JIC box and a 1/2 inch pipe mounted hi-output strobe light head with a 360 Lexan lens and a long life (24,000 hour) strobe tube. The 7120R features a built-in synchronizing flash circuit, and is available in six lens colors (amber, blue, clear, green, purple, and red). Each unit contains a built-in RFI filter to protect against harmful electrical interference. Features NEMA 4X enclosure 2000 Effective Candlepower 24,000 hour strobe tube Built-in Synchronizing flash circuit Built-in RFI Filters Polarity protected Solid state power supply Optional Lens Dust Cover Ordering Information 7120R	Remote Power Strobe NEMA 4X	120VDC Synchronizing Specifications - Synchronizing Circuit Connection This is a low voltage, low power customer connection which requires one 22ga twisted pair run between each light. Max length between furthest lights 3000 feet. Up to 100 lights can be synchronized. Synchronizing Circuit Features: Each light contains its own flash rate timing circuit which operates the lamp automatically and a bi-directional synchronizing circuit which overrides the internal timing circuit when connected to another light. When two or more lamps are synchronized together, failure of any lamp will not prevent other lamps from operating. Specifications Light Output	2000 ECP Flash Rate	40 FPM Operating Current	0.4 Amp average Power Supply Output	26 Watts -- 20 joules per flash Size and Weight	Power Supply Enclosure = 8.25 inches tall x 6 inches wide x 4 inch deep Remote beacon = 5.5 inch dia. x 6.75 inches tall Total weight = albs. Available Options Model No. Description 800/1250-DC	Lens dust cover Replacement Parts Model No. 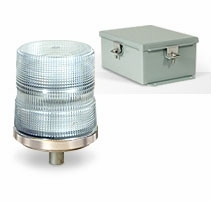 Description 6001	Xenon strobe tube 1700	Color lens (please specify color) Architect and Engineer Specifications High Intensity Power Strobe 7120R The visual signaling beacon shall be Tomar model number 7120R series or approved equal. The light source shall be a plug-in field replaceable single-flash xenon strobe lamp. The warning beacon shall have a Lexanï¿½ lens and be designed to accept a dome guard. Light intensity is to be 2000 effective candlepower. The beacon must be able to be mounted remotely from the power base, and the strobe tube is to be rated at 24,000 hours lamp life. Voltage shall be 120VAC. Strobe light shall be designed to accept a dome guard and lens dust cover. Model 7120R is a double-flash strobe designed for heavy duty industrial use in steel mills and large manufacturing plants where very high light output is required. At 40 flashes per minute and 2000 effective candlepower it is Tomarï¿½s brightest industrial visual signaling device. It features a remote mounted solid state power supply in a NEMA 4 JIC box and a 1/2 inch pipe mounted hi-output strobe light head with a 360 Lexan lens and a long life (24,000 hour) strobe tube. The 7120R features a built-in synchronizing flash circuit, and is available in six lens colors (amber, blue, clear, green, purple, and red). Each unit contains a built-in RFI filter to protect against harmful electrical interference. This is a low voltage, low power customer connection which requires one 22ga twisted pair run between each light. Max length between furthest lights 3000 feet. Up to 100 lights can be synchronized. Each light contains its own flash rate timing circuit which operates the lamp automatically and a bi-directional synchronizing circuit which overrides the internal timing circuit when connected to another light. When two or more lamps are synchronized together, failure of any lamp will not prevent other lamps from operating. The visual signaling beacon shall be Tomar model number 7120R series or approved equal. The light source shall be a plug-in field replaceable single-flash xenon strobe lamp. The warning beacon shall have a Lexanï¿½ lens and be designed to accept a dome guard. Light intensity is to be 2000 effective candlepower. The beacon must be able to be mounted remotely from the power base, and the strobe tube is to be rated at 24,000 hours lamp life. Voltage shall be 120VAC. Strobe light shall be designed to accept a dome guard and lens dust cover.